The city of Bergen is Norway’s second largest city and is situated in the extreme west of the country in Hordaland region. The county name is Fylke and the public transport in this area is administered by Skyss. The tramway returned to Bergen in 2010 in the form of a modern light rail system. It is branded as Bybanen, which translates to ‘city railway’ and at the time of filming in June 2016, runs from Byparken to Lagunen a total of 13.2 km, with an extension planned to the airport. There are 20 stations, six tunnel sections and street running in the city centre. The French company Keolis is responsible for the day-to-day operations of the services and their logo is carried on the trams. The current fleet is made up of 20 Stadler Variobahn trams, which are five-section, bi-directional vehicles, 100% low-floor, numbered 201-220. Three of the original batch ordered by Bergen were delivered to Tramlink in Croydon. A smart livery of orange and light grey is carried on the trams with different interior designs carried on their ceilings. Each tram has a different ‘chime’ prior to the stop announcement ranging from classical to modern pop music! We also look at the trolleybuses that operate in Bergen on this programme. Currently there is now only one route, which is operated by Tide Buss AS on behalf of Skyss. There are just six low-floor articulated MAN/Neoplan trolleybuses of the N6221 type. Smartly turned out in an orange and white livery they operate on route 2, but are supplemented by buses, usually articulated Mercedes-Benz Citaros. Our filming begins at the city centre tram terminus at Byparken. Our cameras follow the line to the Florida stop along Nygårdsgaten where we see the trams operating along the street sections and grassed reserved track. Locations include Starvhusgaten, Kaigaten, Nonneseter, Lungegårdskaien and Agnes Mowinckels gate. 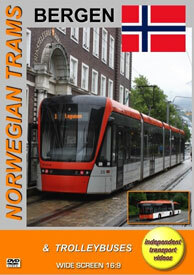 We then ride on the trams boarding tram 216 at the start of the line at Byparken and travel to Kronstad. This is where the depot is situated. From here we board tram 218 and travel to Wergeland and catch the action at this tram stop. It is now time to board tram 210 to Nesttun, which was the terminus of the original route before it was extended to Lagunen in 2013. We continue our journey to Lagunen on tram 206, where on arrival we film the tram terminal and the bus exchange below at this busy transport interchange. We now take a look at the trolleybuses. We see bus and trolleybus action at Småstrandgaten in the city centre before boarding trolleybus 8198 (EL-10902) a MAN Neoplan N6221 on route 2 to Birkelundstoppen. We enjoy the sights and sounds of the trolleybus as it climbs its way to the lofty heights of the terminus at Birkelundstoppen. We return on similar vehicle 8199 (EL-10903) to Olav Kyrres gate in the city centre - as you will see a spirited and tuneful ride! Bergen is a very pretty city, but sees a high average rainfall! Some of that rain fell during our visit, but this did not deter our filming to bring you this incite to the trams and trolleybuses of Norway’s second city. Enjoy!